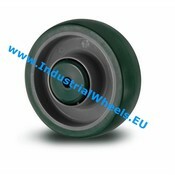 Horticulture wheels with rubber or polyurethane tread. Perfect for highly demanding environments. These wheels are perfect for the transportation of very heavy loads over smooth surfaces (tiles, cement or coatings) because of their low rolling resistance. The high cut, tear propagation and durability ensure a long life in an industrial environment. The rubber tread is quiet and creates a smooth ride. The downside of the rubber tread is that it's more prone to wearing off. 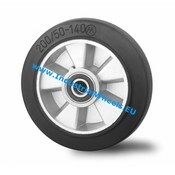 These wheels can also be used for care beds, cleaning machines, computer equipment, display stands, dustbins, file carts, food transport equipment, laundry carts and medical-technical equipment. Additionally, they can be used in industrial kitchens.